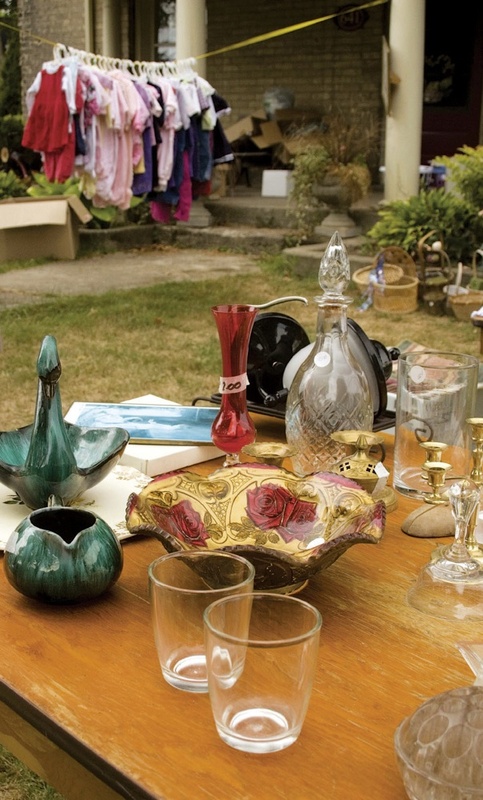 Stay focused on these top 10 tips for selling, bartering, or giving away excess stuff. 1) Do one small project at a time: clear out a junk drawer or the medicine cabinet. Take on the larger spaces, such as the garage or attic, in manageable timeframes. The goal is to avoid getting overwhelmed and abandoning the project completely. 3) When evaluating that ultra-deluxe espresso maker that’s been in its box since you bought it two years ago, ask: Do I use this? Would I spend my hard-earned money on buying this item today? If not, recycle or regift it. 4) Serious mementos from times gone by? Items that seem impossible to let go of for sentimental reasons should be boxed up and put away. Revisit the box in six months to gauge the contents’ importance. 5) Think and act quickly. Do not dawdle over old photo albums; reminiscing is a completely different activity. Make space to do that another time. 6) Handle items only once. Sort them into boxes labeled Trash, Donate/sell, Keep. If need be, have a friend or relative stand guard to prevent “second thought” re-acquisitioning. 7) Forget about “collectors’ value” and making a fortune from selling your grandmother’s old china on eBay or Craigslist. Buyers are fickle and selling stuff online can take a lot of time that could be used more constructively. If an item has clear, significant antique value, set a deadline to get it to a credible appraiser instead. 8) Box up stuff for a yard sale—then hold one! At the end of the day, re-box whatever didn’t sell and take it to the Salvation Army. Better yet, leave it on the street with a “free” sign. Someone who needs the stuff more than you do will be along in no time to take it away. 9) Once things are in bags or boxes, get them out of the house and en route to their final destination. 10) Avoid acquiring any new, nonessential items. 1) It will be used within the next month. 2) It can be paid for right now (no frivolous credit-card use). 3) There is a clear place to put it away, so it doesn’t add clutter. 4) True need, rather than impulse or assuaging “bad feelings” (e.g., anger, depression), is motivating the purchase. 5) Acquiring the item is consistent with life goals and values. 6) You can explain what, if anything, getting the item will truly add to your life. Find a good home for your stuff. “People who are getting rid of things want the object they value to go to someone who also values it,” Steketee explains, “almost like it was an animal.” Charitable venues are countless: BigBrother/Big Sister; the Salvation Army; Goodwill; local thrift shops, churches, or homeless shelters; and international-aid organizations. The Cambridge Public Library, which lists places to donate books at www.stephencoren.com/cplnew/DonationsBooks.htm. www.careergear.org takes men’s and women’s suits, jackets, ties, shoes, and other professional garb. www.cradlestocrayons.org donates clothing, shoes, books, and school supplies to low-income children. www.craigslist.org offers buying, selling, and bartering activities as well as a “Free” section. www.freecycle.org is a grassroots nonprofit network that promotes the reuse and recycling of goods. www.hgrm.org/donate_goods.htm collects and distributes household items. www.mhopus.org (Mr. Holland’s Opus Foundation) donates musical instruments to schools. www.SportsGift.org collects used sports equipment and sends it to children around the world.